The Westin Seattle is your front door to the Emerald City, the jewel of the Pacific Northwest An ideal urban retreat, we are just steps away from the Washington State Convention Center, Pike Place Market, and Seattle's most enticing shops.We are one of only two hotels in the city offering unobstructed views of Puget Sound, Lake Union, and the Seattle skyline. After a day of meetings and sightseeing, relax and unwind in the elegant Lobby Bar, featuring a full-service bar and flat-screen TVs. For fresh Northwest seafood, visit Coldwater Bar & Grill in the lobby. It's a fantastic place for breakfast, lunch, dinner, and drinks. Or stop by the Fifth Avenue Corner Cafe for light fare and snacks.Enjoy modern elegance in our newly renovated lobby, the "heart of the hotel." Wi-Fi Internet access and a cozy gathering space make it perfect for hosting a casual meeting or simply catching up with friends.Welcome to The Westin SeattleStarwood Turbo Net High Speed Internet Access is available in all guest and meeting rooms.Special Condition:The City of Seattle is completing a major resurfacing project on Fifth Avenue from Denny Way to Marion Street. The work is scheduled to be finished in the Fall of 2008. Fifth Avenue remains open to traffic but you may experience intermittent noise and lane closings. 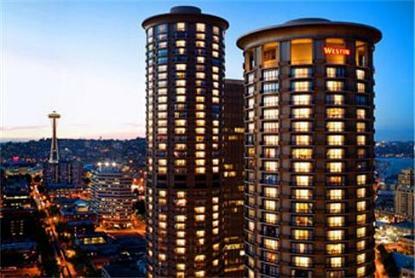 Please be advised that The Westin Seattle motor entrance is located on Westlake Avenue.